Lake Milton located in Mahoning County, Ohio approximately 10 miles west of Youngstown and 25 miles east of Akron. Lake Milton is a great place to visit or to call home. The 1,685 acre reservoir offers a wide variety of water-related recreation. Boating enthusiasts enjoy Lake Milton’s unlimited horse power designation. 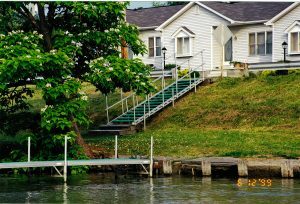 For decades Metal Craft docks, boat lifts, and stair systems have been installed by dozens of satisfied customers along the shores of Lake Milton. Contact us today so you too can enjoy Lake Milton docks and lifts by Metal Craft Docks for decades into the future. Metal Craft Docks require minimal maintenance due to their aluminum structural components; You’ll see many original sea green dock docks just looking around the lake! Our docks feature all aluminum decking with a non-skid, poly acrylic finish. Because of our non-skid finish, boaters can safely enter and exit watercraft. Metal Craft stationary docks are preferred option at Lake Milton; however floating docks are available in your choice of one of three deck colors. Metal Craft Docks can be constructed in many different layouts and are available in 4 standard widths and 3 standard lengths. Purchasing a dock for your lake house is just the beginning. Having the correct pier accessories ensures you get the most for your investment. Therefore, Metal Craft offers solar dock lights, dock rub rail and dock cleats to meet your needs. Our accessories easily relocate without leaving unsightly holes in the decking if you change the layout of your dock. Whether your dock is a swim platform with a retractable ladder or mooring boats after a long day of fishing, Metal Craft can outfit your needs! Your lake experience wouldn’t be complete without the appropriate watercraft and aluminum boat or PWC lift. Metal Craft offers boat lifts to accommodate weights up to 5,000 lbs. and PWC lifts to accommodate up to 1,200 lbs. Metal Craft aluminum boat lifts feature a deep “V” design allowing entry to the lift in shallow water. Our side trussed design provides extra strength and makes entry to your watercraft easy. Accessories include optional side guide and bunk upgrades including pontoon and tritoon kits, electric motors, a canopy, and many others so you can outfit the lift for your needs! Install a set of Smarte Jacks and wheels to make end of season removal and re-installation easier. Contact us today for more information. 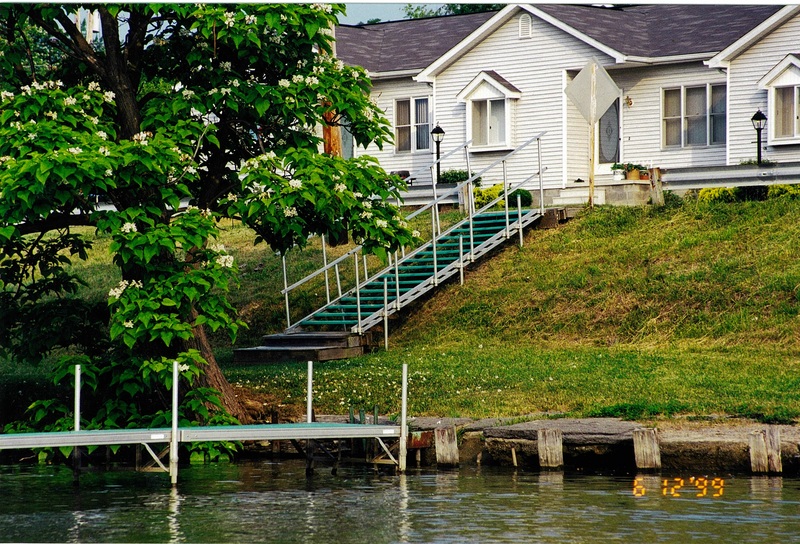 Many homes on Lake Milton have steep, uneven hillsides leading to their dock or lift making access unsafe and challenging. Metal Craft fabricates adjustable aluminum stairs to color coordinate with our dock systems. Our outdoor stair cases start at 3′ lengths up to 20′ lengths. For longer hillsides, a combination of stair sections and platforms breakup long climbs to the top of the hill. Stair systems are either 3′ or 4′ wide and have either 1 or 2 handrails. Metal Craft stair systems are also useful for entering water from your dock. Simply connect our stair system to your dock and you now have a set of boat dock stairs! You’re four-legged friends will appreciate the ease getting out of the water. Call us today to discuss our stair options! Metal Craft Docks is celebrating over 80 years in boat dock manufacturing and fabrication. Metal Craft products are made entirely of aluminum so they are naturally light-weight making installation and removal for storage easier than traditional options such as wood or steel. We are proud of the craftsmanship that goes into every one of our products manufactured at our Painesville, Ohio facility. When you purchase a Metal Craft dock, lift or stair system you are making an investment. We know you will be satisfied with your Metal Craft purchase for decades into the future – just ask any of our satisfied customers on Lake Milton!